PhotoFiltre is a free image retouching program. It not a widely known but is certainly worth trying. It has plenty of features and fun filters that casual photo editors will find useful. Photofiltre is not a widely known photo retouching program, but it has plenty of features that casual photo editors will find useful. PhotoFiltre won’t cost you a penny; it’s free to download. As its name suggests, PhotoFiltre offers plenty of terrific filters and tools for enhancing images. There are filters for adjusting brightness, contrast, increasing and decreasing saturation as well as sharpening or blurring images. It has a host of artistic filters, too, including textures, watercolor, pastels, sepia tone, black and white, night and sunlight effects and emboss. It even has a puzzle effect. Sample filter effects. The first is the original. The program doesn’t offer layers, though it does allow you to put text over an image. Many don’t use layers anyway so, for them, the lack of this feature is no loss. Whatever filter you apply it can be undone. It also can be faded. So if the original effect is too strong, you can reduce the amount via the Edit menu. 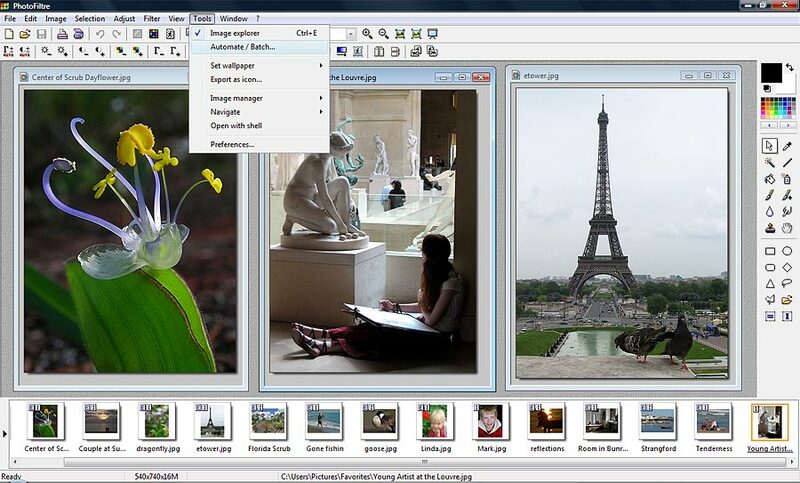 PhotoFiltre includes an Image Explorer, which is accessed through the Tools menu. Open any image folder on your hard drive and its contents are shown along the bottom of the window. Simply double click on a photo to open it and begin editing. You can do automated batch processing of any number of photos. Select the Source and Output folders and file format such as JPEG, GIF and TIFF. Next select the image size and if you want a frame automatically added to the images. The size and color of the frame can be adjusted. 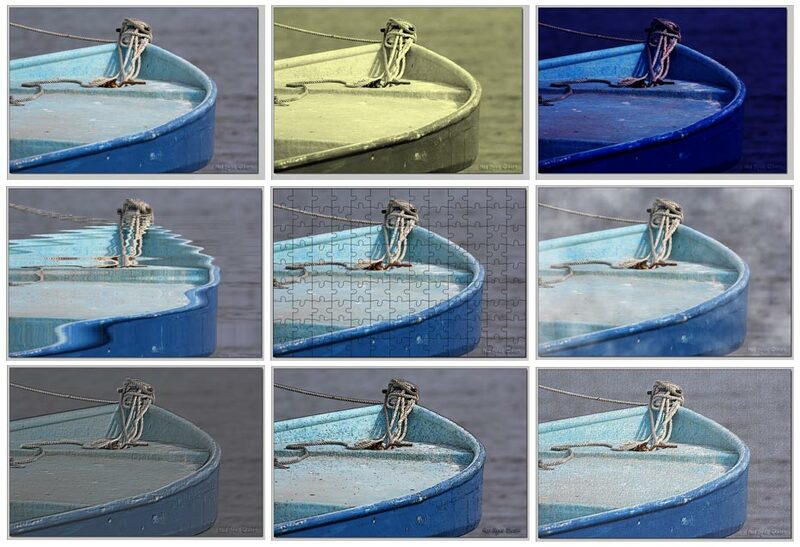 During the batch process, brightness, contrast, saturation and Gamma correcting can be applied to photos. You can apply a few filters such a sharpening and scanlines, and rotate or flip images. The batch process is fast and easy. Since not all photos need the same amount of processing, do a test run to see if the results are to your liking. An advanced version of PhotoFiltre , called PhotoFiltre Studio, is also available for a nominal fee. Unlike the free version, PhotoFiltre Studio has layering capabilities. It is shareware and can be tried for a 30-day period. The free version is here. You’ll also be able to download free Add-ons and Plug-ins at the site. If you’re looking for a image enhancing program, give PhotoFiltre a try. It’s free, fun and may meet your photo processing needs.